Chicken like bright colors. This product is made of the natural wood. It will fade when meeting the water because no harmful color fixing gel included. Maybe it needs some time for your lovely chicken to take to it. But, you need to believe chicken are born to like flying. Suitable for your lovely chicken. 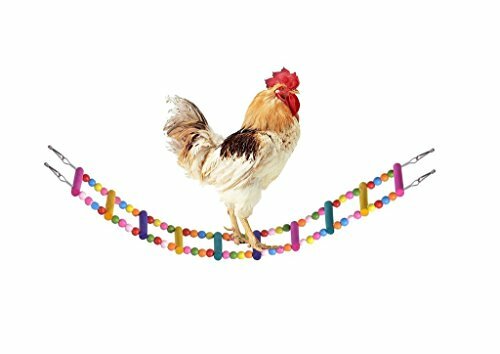 Colorful and beautiful, your chicken will surely enjoy it. Note:Every natural wood is unqiue, cracks or tree eyes are unavoidable and color are random. Note: 4 metal clasps included. No harmful color gel added. If you have any questions about this product by Bwogue, contact us by completing and submitting the form below. If you are looking for a specif part number, please include it with your message.